This exercise is designed as a lab, but can also be used as a classroom demonstration. It requires the use of the VPython programs which require Python and VPython to be installed on your computers (this software is free and has been made available on the default image for all computers on our campus). The models show the gravitational collapse of a set of particles to create a central "Sun" with other orbiting particles, a simple model to demonstrate elliptical orbits, a simple model of the solar system showing the planetary orbits (speeded up). 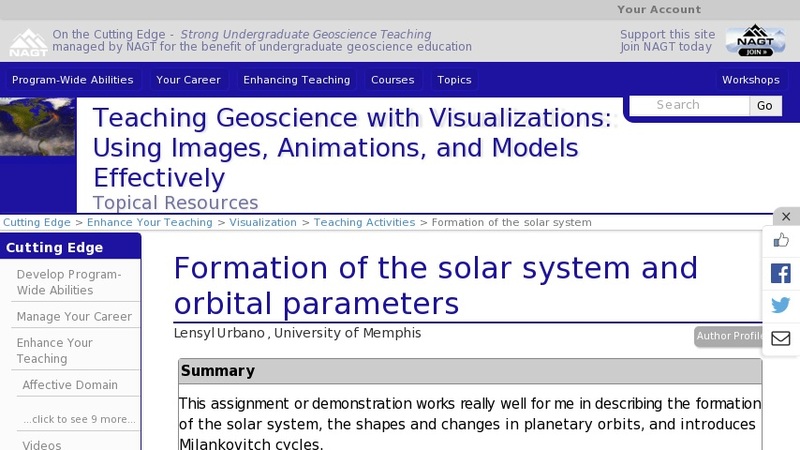 The task is to assess one hypothesis about the formation of the solar system (from a dust and gas nebula) by comparing the computer simulation (model 1) to the shape and form of the actual solar system (model 3). Students can interact with the 3d models by, for example, selecting planetary objects to track, and changing perspectives in 3d space. In doing this students learn about the shapes of the planetary orbits (ellipticity etc) and reasons that they change.